The 23rd Footballers Golf Classic will once again return to the Hotel Principe Felipe, La Manga Club on the above dates. 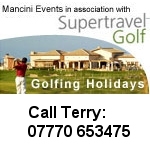 Included in the cost is 4 rounds of competition golf, 5 nights twin room accommodation at the 5 star hotel, daily buffet breakfast, welcome BBQ and prize giving plus draw for the main event, gala dinner and prize giving with entertainment, golf shirts, gifts, prizes, trophies and a full colour printed itinerary. £1,600.00 per person excluding flights and transfers. For further information and to reserve your entry please contact donna@mancinievents.co.uk 07918 644900.